Let's get the basics down first... you must provide for your beloved pet comfort and security before you even think about toys and other fun items. 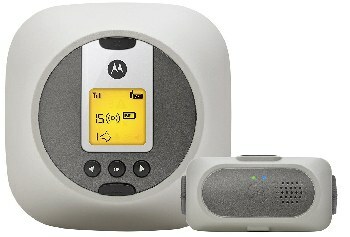 This short list recommends the best dog house, heated pet beds and GPS tracking on the market. We also have a few words on confining your pet with "shocking devices". This is where Mini and Pepper sleep. 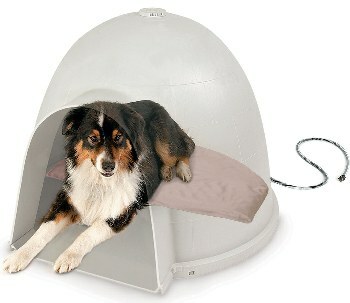 We have one of these for each of our dogs, and highly recommend them. Pepper is getting up in years and probably has arthritic pain. She uses hers all winter long, all night and even on cool days. Mini uses hers occasionally. She is young, has a shaggy winter coat and seems to tolerate (and love) the cold weather very much. These dog houses are extremely sturdy, I would even say they are indestructible. Easy to pop together and knock apart for an annual scrubbing. 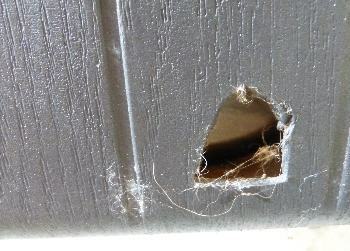 Rear vent holes, rain diverting rim, and raised interior floor. Small, Medium or Large available thru affiliate buying link below. We love our pets dearly, but they are all "outside pets" and are never allowed inside the house. I know some of you pet-lovers out there might think this is cruel and unusual punishment; but our animals do just fine; they were never allowed inside, so they don't even try to get in. 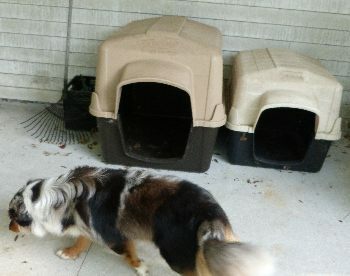 Outside, they have plenty of room to roam, protection from the elements, (covered porches and dog houses) and each dog and cat has his own heated pet bed in the winter. 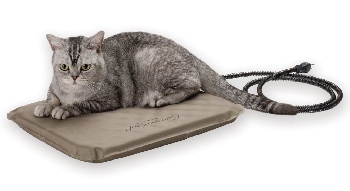 After much research, we settled on K&H outdoor heated pet beds, and have been using them for years now. They are the "Cadillac" in heated pet beds. 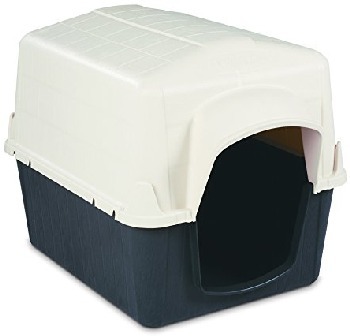 Although a little pricey, these are very sturdy, quality heated pet beds, designed for protected outdoor use, and we recommend them highly. Amazon Small #1070 or Large #1090. Make sure you get the one that says "Outdoor". 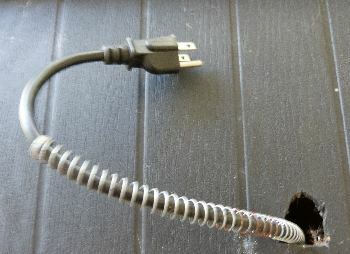 If you also buy the Petmate Dog House above, do like we did: Cut a hole in the lower back corner of the dog house, just big enough to push the plug thru. Much neater than cord dangling out the front, and keeps Mini from pulling the heating pad out to play with. We have included GPS pet tracking devices in our "recommended" list because they sound so promising. 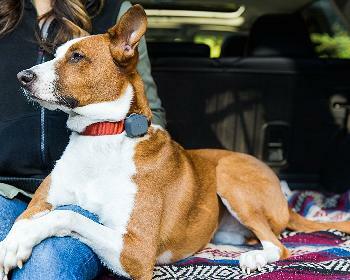 The technology is here for tracking and finding your lost pet via smartphone app! This should work fine for a pet lost in the woods or to alert you quickly when he strays too far. But what if he's stolen? All the thief has to do is remove the dogs collar, discard the GPS pod... and Voila! He has a new dog! In our situation, we worry much more about someone stealing our Mini than her getting lost. She is such a beautiful (and valuable) dog, that a dognapping is more likely. And a GPS pet tracking device would not thwart a theft. We'll keep an eye on these trackers and wait 'til they develop a collar/pod combo that cannot be easily removed from the dog. Then you're talking! Proactive Alerts: Get email, app or text notification when your pet leaves their safe zone (before they get too far away). Nationwide coverage on the AT&T cellular network in the U.S. Subscription plan costs at least $6.95/mo and a Wi-Fi network is required. The unit itself is less than $65 on Amazon. Read all the reviews and fine print to make sure your cell coverage and monthly fee are appropriate and acceptable. No fencing to erect; train your dog not to cross the perimeter line with "9 levels of static correction- from gentle to firm". Keep reading the fine print and customer reviews. "Static Correction means SHOCKING. (How can any shock be described as "gentle"? We are totally against ANY pet containment system that involves shocking them. The problem with that method is even smart dogs fail to connect the collar shock with breaching an invisible perimeter line. Just minding his own business, walking along... and ZAP! You might just get your pet trained using this system; but just as likely to turn him into a traumatized, neurotic animal. This is no way to provide pet comfort and security. Just ask yourself this question: Would you put a shocking device on your toddler? Even if only one shock was all it took to train him? I can't imagine ever using a shocking collar on any of my dogs, and I hope you feel the same. 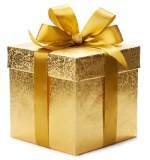 On a lighter note, why not take a peek at some of our favorite pet toys.